The Fellowes Powershred 485Ci Cross Cut Paper Shredder is 100% Jam Proof System eliminates paper jams and powers through tough jobs. Auto-Oil automatically lubricates the cutters to enhance performance and extend shredder life. Patented SafeSense Technology stops shredding when hands touch the paper opening. Energy Savings System reduces energy consumption by up to 70% compared to conventional commercial shredders during normal usage. TAA Compliant. Features extra-wide 16-Inch paper entry. Continuous duty motor for non-stop shredding. 2-year product and service warranty plus lifetime on cutters. 28 sheets per pass. 5/32-Inch x 1-1/8-Inch cross-cut particles (Security Level 4). 37.5-gallon bin. 38-Inch H x 25-Inch W x 20-Inch D. For 10+ users. 100% Jam Proof System eliminates paper jams. Auto-Oil automatically lubricates the cutters. Patented SafeSense Technology stops shredding when hands touch the paper opening . 5/32-Inch x 1-1/8-Inch cross-cut particles (Security Level P-4). Turbo Jam release clears jams quickly and safely. Can process CDs, paperclips, credit cards and staples. Shreds 28 sheets per pass, at a rate of 14 feet per minute. 12" paper entry width; 35-gallon pull-out basket. Creates confetti shreds; includes 20-year warranty on cutter and two-year warranty on machine. Cut Size (inches):	5/32" x 1-1/8"
This was bought for our office staff size of six. Too much capable. We were able to cancel the mobile shredding service saving over $400 per year. We keep the cutters oiled by periodically placing the recommended oil on paper and running it through. The few jams we have had were human caused. Definitely recommend. Excellent at doing what it is supposed to do - shredding. One thing though....you need to have a dedicated outlet for it. We already had this model when given the opportunity to replace it with anything we wanted. We decided that because our old model was still running strong and easy enough to maintain, that we'd like another, newer model and are pleased to have it! Our organization does a lot of shredding of docs and CDs/DVDs so we needed a powerful strong unit. Replaced a very old, NOISY shredder with a Fellowes. Only issue seems to be slower shredding, but that could be due to fact Fellowes is a criss-cross and old machine did strips. Old machine sounded like a jet taking off. This is a great shredder! Powerful shredder without jam up issues. Only issue is noisy and occasional squeaks. With all of the regulations regarding identity theft, it was imperative that we destroy whatever paper documentation that was no longer necessary for our credit cards and credit accounts. The C-480C fit the bill and has met all of our expectations. Transcript: This is the Fellowes Powershred 485Ci Cross Cut Paper Shredder! Once you push the power button to wake up the shredder, it’s ready to shred. You don’t have to push the forward button to shred, but having the button gives you more control if something doesn’t shred automatically. You can also hold the reverse button. There is a notification of how thick your stack of pages is. If it lights up red, then take out some pages until it’s in the yellow or below. At this point in will activate the motor. This is the Fellowes Powershred 485Ci Cross Cut Paper Shredder! There is a slot specifically for CDs, envelopes and credit cards—this way the motor is activated when it is inserted. Upon a simple touch of the throat of the machine, the motor will stop and this light will turn on—this is keep safety feature to help prevent accidents. On the inside of the door is space to hold your shredder oil, manual and extra bags. It has an automatic oiler so you don’t have to worry about oiling your machine every month. Pull the top cover up and unscrew the oil well. Poor in your oil and close it all back up. When the machine needs more oil, it will notify you with a light on the panel. You don’t have to worry about removing your staples and paperclips, because it will shred through those too. As long as the stack doesn’t exceed the 28 page limit. From time to time you’ll need to empty the waste bin, recycle your shredding, and put in a new bag. Thankfully the box makes all of this easier. The final result is a level P-4 shred—which is generally regarded as the best shred when you want security, but aren’t looking for top secret. And lastly, it is on wheels for easy transportation when required. The Powershred 485Ci can shred up to 28 sheets at a time which is phenomenal for a cross-cut machine. The cutters are strong enough to destroy CD’s, credit cards, and junk mail so you’ll have a lot of security. This shredder is designed for departmental and large office use. It features a 35-gallon waste bin and a continuous-duty motor so you and your colleagues can shred throughout the day. Maintaining this machine is easy since it has an automatic oiling system. Using the Powershred 485Ci is easy and safe since it has the ever popular SafeSense feature. This feature causes the shredder to stop running when your hands are too close to the feed opening. Also, the machine has a paper overfeed indicator to help you prevent paper jams. Finally, the Powershred 485Ci is covered by a 2-year warranty. The cutters are covered as long as you own the machine. 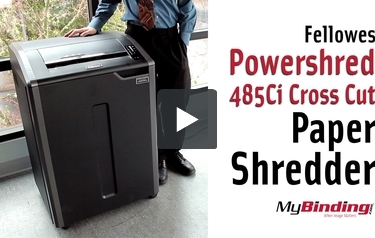 The Powershred 485Ci is another great machine from Fellowes and it’s perfect for larger workplaces. Check this machine out if you need to get a new paper shredder for your office. Throat Width 16" 12" 9.5" 9.5" 9.5" 9"
Unit Dimensions (H x W x D) 37.5" x 25" x 20" 37.5" x 25" x 20" 34.69" x 20.13" x 18.13" 30.75" x 17.75" x 17.1" 30.75" x 17.75" x 17.1" 28.9" x 11.25" x 21.06"
Thank you for your question. The Fellowes Powershred 485Ci Cross Cut Paper Shredder has the Auto Oil feature and will automatically oil itself. There is a indicator when you need to refill the oil. You can find the Fellowes branded shredder oil here . Does this have a bag or a box inside to catch the shred? The Fellowes Powershred 485Ci Cross Cut Paper Shredder came with a bin but it has been discontinued by the manufacturer.